The East Devon AONB was designated in 1963 and is one of the 46 AONBs situated across the UK. The National Association for Areas of Outstanding Natural Beauty provides general information about AONBs, whilst the South West Protected Landscapes Forum exists to provide information and a regional voice for the 14 Protected Landscapes which, together, make up 38% of the South West of England. 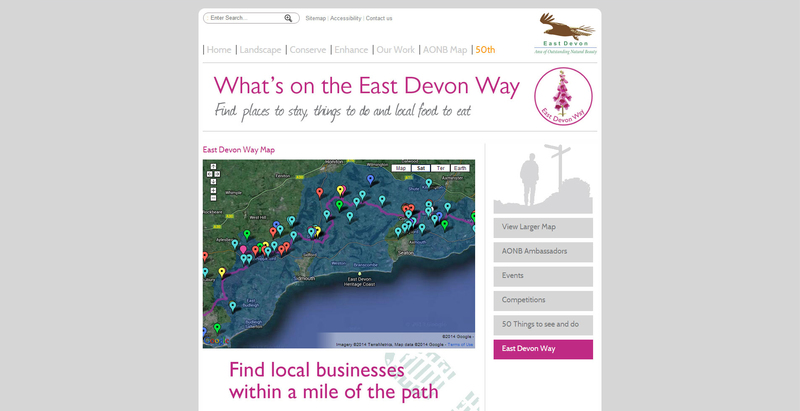 East Devon AONB created a project called East Devon Way – this project was created to make it easy to locate accommodation, eateries and businesses within a mile of the East Devon Way footpath. They were looking for a new section for their website that was unique and stood out, specially made for the East Devon Way project. Cosmic was happy to provide a bright and user friendly page with a distinctive design and a customised map.